BRISTOL - After his team had started the season 2-0 by putting 40 runs on the board and racking up 40 hits, Scott Redman was champing at the bit for what was supposed to lie ahead. The Bristol Eastern softball team’s head coach walked away disappointed. After cruising past Northwest Catholic and Plainville to start the season, the Lancers were set for back-to-back high-profile matchups against defending Class LL state champion Amity on Saturday and a clash on Tuesday with Southington, which went unbeaten and garnered the No. 1 seed before falling to Amity, 6-5, in last season’s semifinals. The matchup with Amity, however, was canceled due to weather. 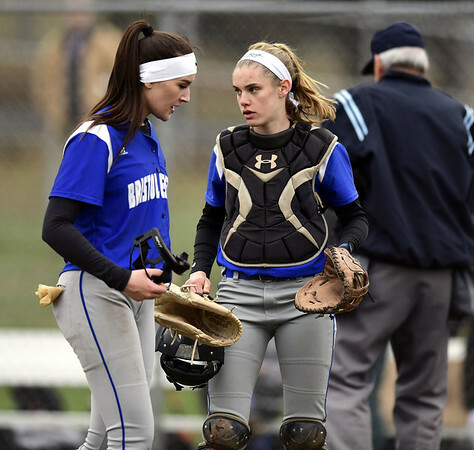 And on Tuesday, in a game originally scheduled for Monday before being pushed back due to rain, the Lancers defeated Southington 3-2 in anticlimactic fashion. The Blue Knights scored three runs in the sixth to take a 5-3 lead. But after Bristol Eastern put runners on first and second with one out in the bottom half, the rain started to fall heavily, and the umpires called the game off. Adding to the frustration was the optimism that Tuesday’s game would be completed without issue after it had already been called off. It’s nothing new for the Lancers (3-0) or anyone else in the area to have games canceled or halted due to the weather. It comes with the territory. Starting pitcher Erin Girard had a tough time getting going early, as the two-time All-State hurler had to make adjustments after surrendering two runs in the first inning. After being excited to see how his group would stack up against the state’s best, it’s hard for Redman and company to glean much from the past few days. The Lancers were noticeably off their game, making several uncharacteristic mistakes - including two official errors - that need to be corrected moving forward. Posted in The Bristol Press, Bristol Eastern on Friday, 12 April 2019 21:16. Updated: Friday, 12 April 2019 21:18.